Zurich (AFP) - Palestinian football chief Jibril Rajoub withdrew his association's bid to have FIFA suspend Israel from international football on Friday before shaking hands with his Israeli counterpart. 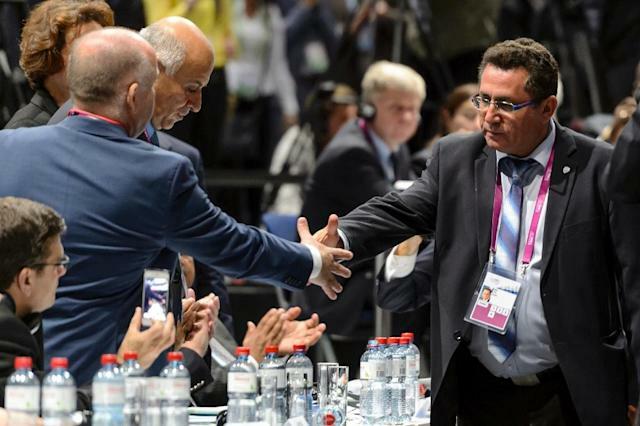 "I have decided to drop the resolution for the suspension," Rajoub told the FIFA congress in Zurich before shaking the hand of Israeli FA president Ofer Eini. But Rajoub insisted the Palestinian FA may repeat the threat against Israel if the key issues of racism and player movement in the occupied West Bank are not resolved. "Palestine has not withdrawn it's application completely, but merely suspended it," he added. "A lot of colleagues, whom I respect and whose commitment to the ethics and values of the game I appreciate, told me how painful it is to hear of the issue of suspension. "But I want to protect the Palestinian footballers, to let them enjoy the privilege of the game as others do." Rajoub said FIFA must now help tackle the issues facing Palestinian players in the occupied West Bank before waving a red card at delegates to emphasise his point. "I think it's time to raise the red card against racism and humiliation in Palestine and everywhere. It is time," he added. Palestine, which has been a FIFA member since 1998, had wanted the governing body to suspend Israel over its restrictions on the movement of Palestinian players. It had also opposed the participation in the Israeli championships of five clubs located in Jewish settlements in the occupied West Bank. In an equally passionate address, Israeli football chief Eini said it is now up to the two associations to find a common ground to promote football and help each other in the troubled region. "Football must serve as a bridge to peace," said Eini. "I'm saying to my friend Rajoub, let the politicians deal with the political points. "Let's do the best for football on both sides. I want us to work together and to be able to cooperate. "We should be able to solve problems by speaking to one another. "There will always be disputes, but if we speak together, we can solve the problems." A FIFA committee, which will include figures from both the Israeli and Palestinian governing bodies, will be set up to resolve issues facing those in football on the West Bank after the congress voted for the initiative. FIFA president Sepp Blatter said he was relieved the issue had finally been resolved. "The matter has been on the table for the last two congresses and I am so happy that it's come to a conclusion," said the 79-year-old, who faced a vote for a fifth term in office later on Friday. "It means two associations can now apply the basic FIFA principle of solidarity with those who have more will share with those who have less." Israel welcomed the avoidance of an "absurd situation" after the motion was withdrawn. "The result of talks at FIFA is positive and I welcome the fact that we didn't arrive at an absurd situation in which a state like Israel would have been suspended from a body whose vocation is, before all, sporting," Israel's assistant foreign affairs minister Tzipi Hotovely said. But he warned that Israel would be fast to combat any future bids to expel it. "In the future we will oppose by all our means states and organisations that want to delegitimize Israel," the minister warned. "We will not allow them to influence the decisions of international organisations."